Find and compare the best prices from a range of well known car rental companies at Wroclaw Airport. This is a free to use facility, enabeling you to book direct with the company quoting the price. 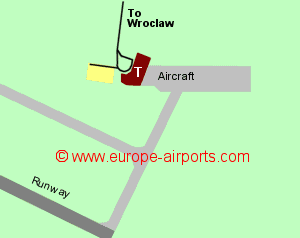 Wroclaw Airport, otherwise known as Copernicus Airport, is located 10Km West of the city of Wroclaw, south west Poland - one of the oldest and most beautiful Polish cities. Wroclaw airport has a modern terminal building, opened in 2012. There is a regular bus service from the airport to Wroclaw central train and coach stations every 20 minutes during the day and twice during the night. Taxis into the city centre or the rail station is likely to cost around 60PLN (12 Pounds). Facilities include 6 bars/restaurants, 9 shops, a currency changing facily, 3 ATMs, post office, conference facilities, and an executive lounge. 2.8 million passengers passed through Wroclaw Copernicus airport in 2017, an 18% increase from the previous year, and its busiest year yet.